How many times have we vegans heard those who eat animal flesh ask us the following? “You talk about having a diet and lifestyle where you avoid killing any living thing, but what about plants? Plants are living things and you kill them.” It seems like they would like to make a case about the futility of being a vegan, since we vegans are committed to eating only plant-based foods and plants want to live as much as any animal does. In other words, they wish to imply that if we’re all destined to be murderers anyway, what difference does it make who or what we’re murdering, or whether it’s a plant or an animal? 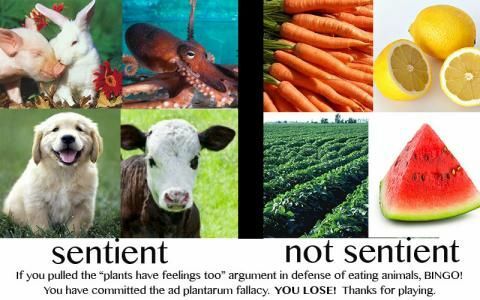 But what they fail to realize is that plants are qualitatively different from humans and sentient non-humans. And although plants are certainly alive, they are not sentient. Plants do not have interests. There is nothing that a plant desires, or wants, or prefers because there is no mind there to engage in these cognitive activities. When we say that a plant “needs” or “wants” water (or sunlight), we are no more making a statement about the mental status of the plant than we are when we say that a car engine “needs” or “wants” oil. It may be in my interest to put oil in my car. But it is not in my car’s interest; my car has no interests. This is not to suggest that we humans cannot have moral obligations concerning plants, but we certainly do not have moral obligations that we owe to plants. That is, we may have a moral obligation not to cut down a tree, but that is not an obligation that we owe to the tree. The tree is not the sort of entity to which we can have moral obligations. We can have an obligation that we owe to all of the sentient creatures who live in the tree or who depend on it for their survival. We can have moral obligations to other humans and non-human animals that inhabit the planet not to destroy trees wantonly. But we cannot have any moral obligations to the tree; we can only have moral obligations to sentient beings and the tree is not sentient and has no interests of its own. There is nothing that the tree prefers, wants, or desires. The tree is not the sort of entity that cares about what we do to it. The tree is an “it.” The squirrel and the birds that live in the tree certainly have an interest in our not chopping down the tree, but the tree does not. It may be wrong morally to chop down a tree wantonly but that is a qualitatively different act from shooting a deer. Try this; at your next dinner gathering, chop a head of lettuce in front of your guests. It’s pretty much guaranteed that you will get a different reaction than if you were to chop the head off a live chicken while it was trying to escape.